Nov 30, 2016 - From the South Yemen Independence day celebration in Aden, Yemen. A soldier holding Yemen's Southern flag. Photo courtesy: Ahmed Shihab Al-qadi. 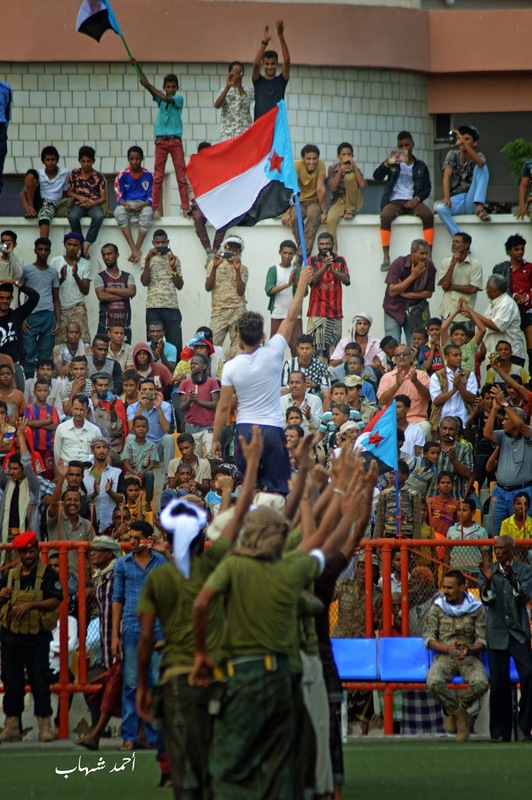 *Today marks the 49th anniversary of South Yemen's independence from the British colony. The anniversary should symbolise a time for rejoicing at the triumph over a colonial rule, but instead, it reflects the growing and contesting realities across Yemen. Nov 30, 2016 - From the South Yemen Independence day celebration in Aden, Yemen. 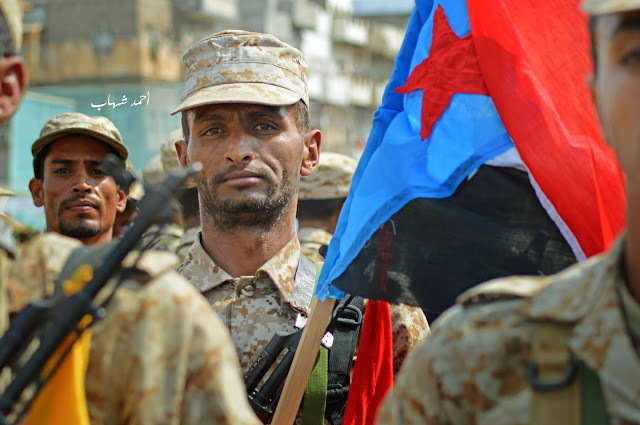 A man holding Yemen's Southern flag. Photo courtesy: Ahmed Shihab Al-qadi. Over the two-year war, this is the second time Saleh has addressed the public, calling on them to cherish unity and fight united for victory against "the Saudis' aggression". 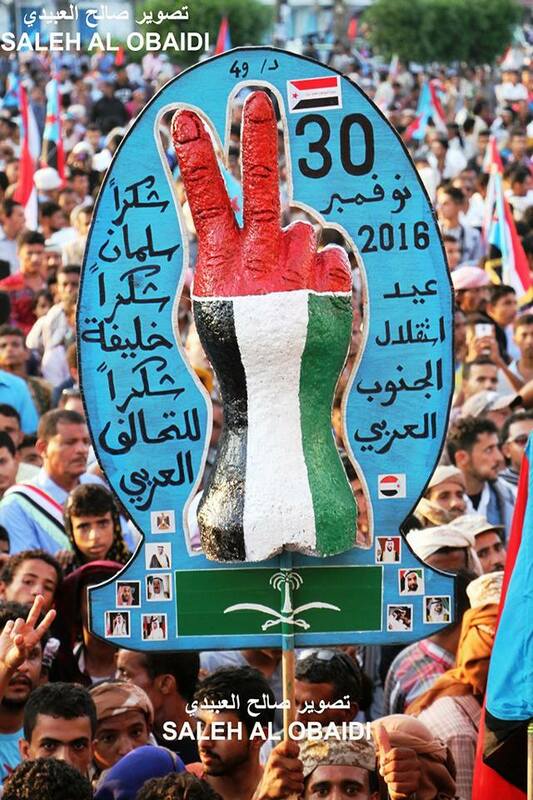 Nov 30, 2016 - From the South Yemen Independence day celebration in Aden, Yemen. Photo courtesy: Saleh al-Obaidi. I remember as a child surviving the almost three-month long fight in Sanaa. In the following months and years, we were taught as part of the curriculum that the 1994 civil war was caused by the "secessionist" "infidels" giving a strong impression that the north was more concerned about unity and the south had perpetrated the betrayal. Nov 30, 2016 - From the South Yemen Independence day celebration in Aden, Yemen. 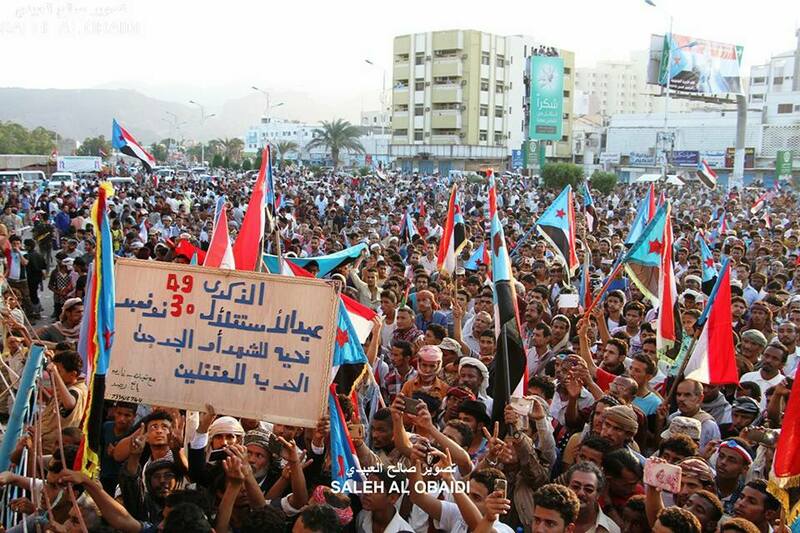 A poster reads, 'South Yemen Independence day. Thank you, Salman, thank you, Khalifa, thank you, the Arab coalition." 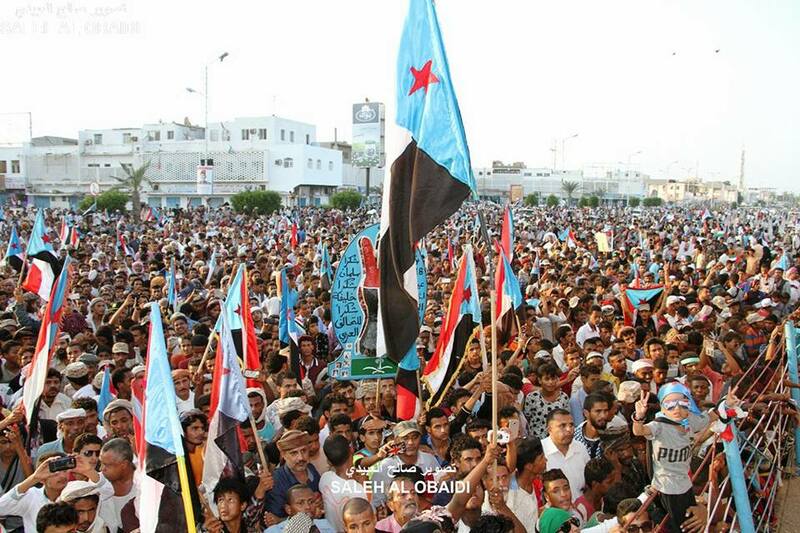 Nov 30, 2016 - From the South Yemen Independence day celebration in Aden, Yemen. Photo courtesy: Ahmed Shihab Al-qadi. Meanwhile, at the UN, Hirak activists are making concerted efforts to win the international community's support for their demands. 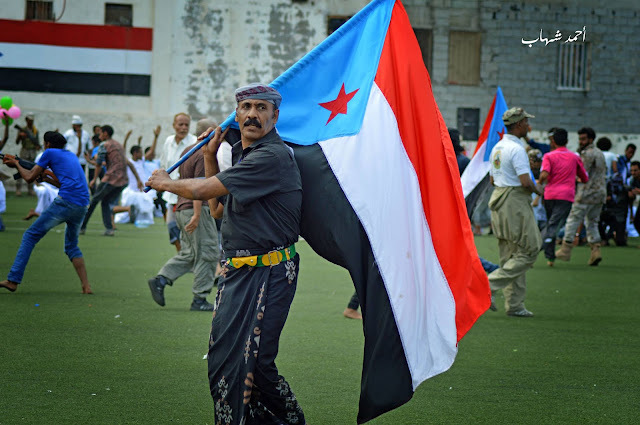 However, southern activists are divided: some demand secession, regardless of ending Yemen's war, and others demand peace first for all Yemen, and then secession. This chaotic governance is a product of several factors: the stalemate in the battle for Sanaa, the failure of international actors to carry out peacemaking efforts in Yemen and the fact that none of the warring sides has made major gains. *This piece was first published on The New Arab, on the 30th November.